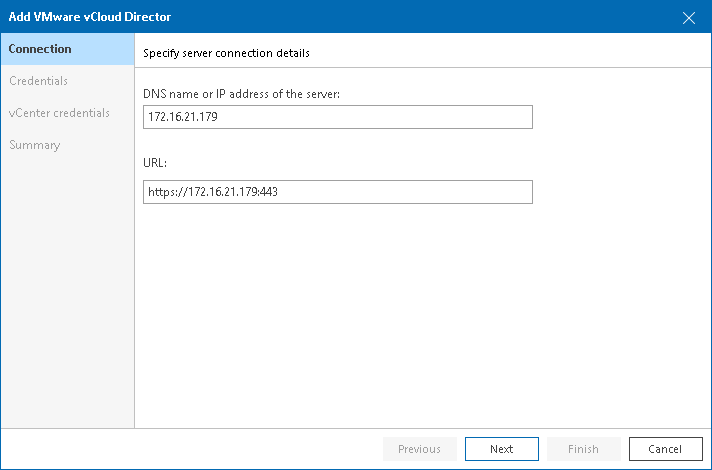 Enter DNS or IP address of the vCloud Director server that you want to connect. Change vCloud Director URL if required. Veeam ONE populates the URL field with a URL used for connecting to the vCloud Director server. The URL format is https://<vcdservername>:443, where <vcdservername> is the DNS name or IP address of the vCloud Director server, and 443 is the default port. If you use port number other than 443, you can change it in the URL field.